What would you think if I told you that you could get a delicious lunch for just $5? That's right: just $5. Well, you can do exactly that at Cafe Stories in Pyrmont. Cafe stories is a down to earth family business run by really friendly staff who seem to be just having a good time working together. With a really casual vibe, this is a great place to stop in for a quick - and delicious - lunch, or maybe your morning coffee and breakfast. 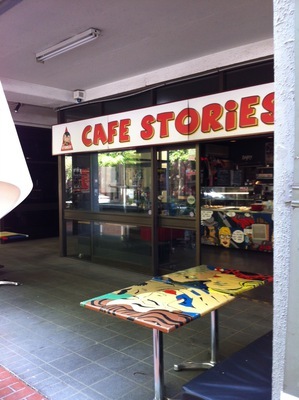 Cafe Stories is a casual cafe in the short shopping strip on Harris Street, between Broadway and Pyrmont. If you're familiar with the area, you'll know that there isn't really very much around there. So it was a very pleasant surprise when I stumbled upon Cafe Stories. 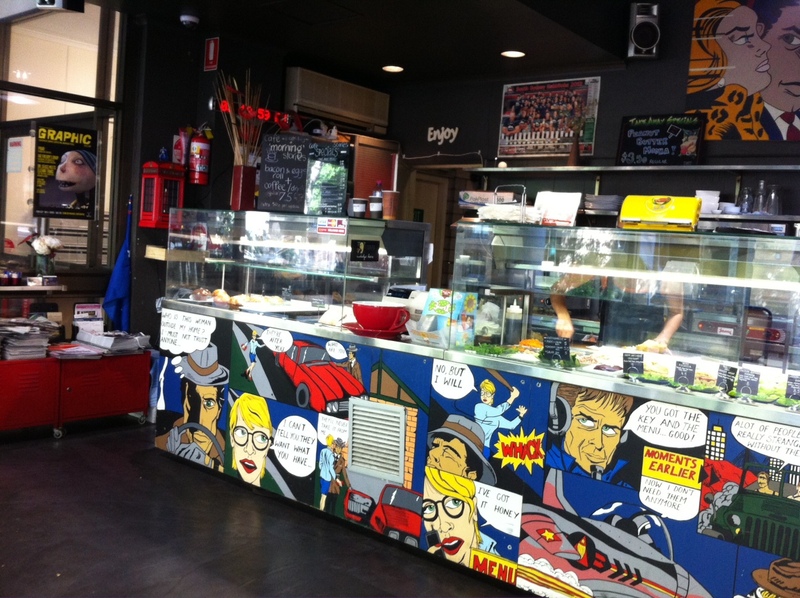 I was drawn in by the bright artwork that adorns the tables and interior, in search of a quick lunch. Standing at the counter, I looked around for the menu but my attention was immediately taken by the display of food in the counter. 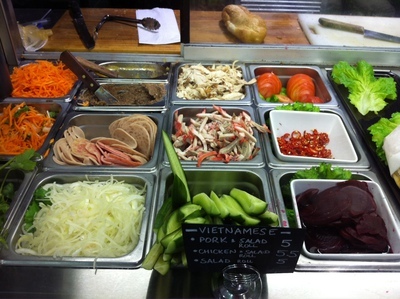 At first, it looked like a standard sandwich bar, but with a second glance I realised there was something different. Turns out, Cafe Stories was offering Vietnamese sandwiches - famously known as the 'Vietnamese Pork Roll'. In addition to pork, Cafe Stories also offers Chicken Rolls and Salad Rolls. 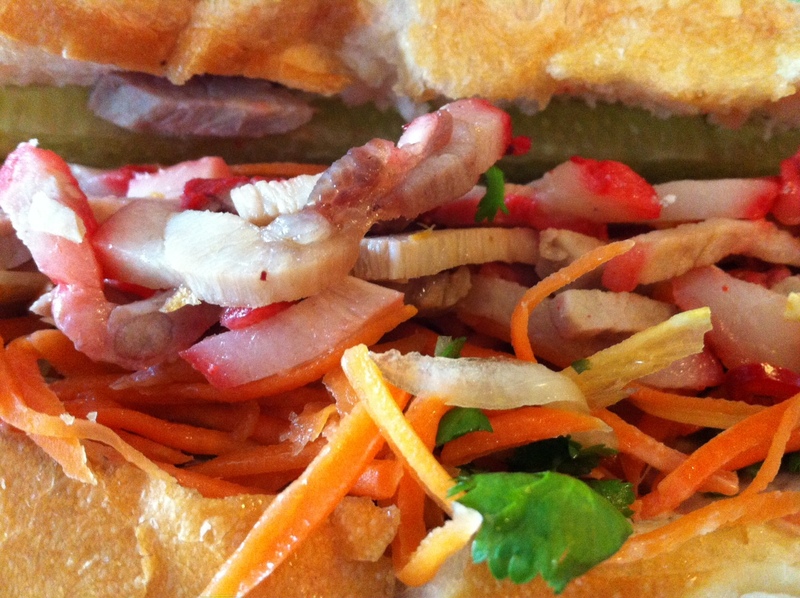 If you've never tried a Vietnamese Pork Roll before, I highly recommend it. Made up of a crusty bread roll filled with different types of pork - BBQ pork, pork loaf - pate, lettuce, carrots, cucumber, onion, shallot, freshened with coriander and spiced up with a hint of fresh chilli. Delicious and moorish. 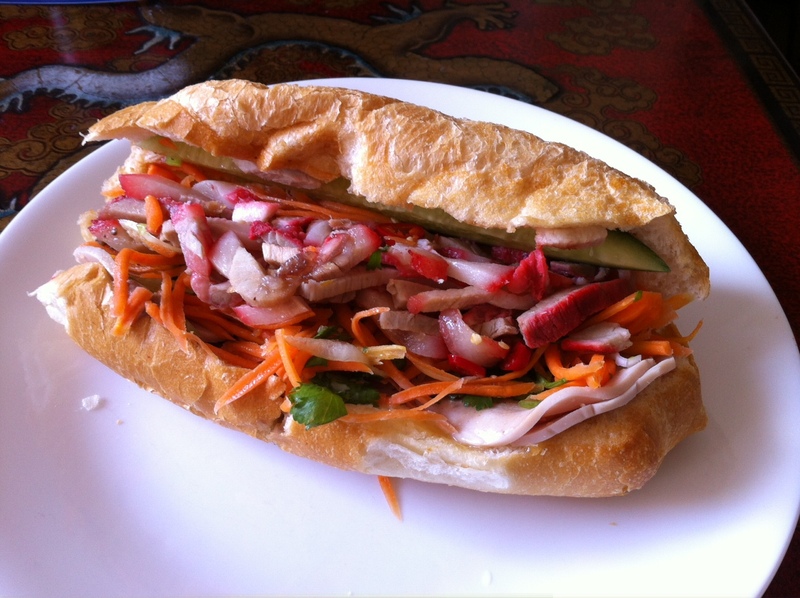 The best thing about the Vietnamese Pork Roll at Cafe Stories is that it's just $5 - fantastic value for a delicious lunch. It's a pretty large roll as well so you definitely won't need to eat again until dinner time. You really can't go wrong. I've had plenty of Vietnamese Pork Rolls in my time and I can honestly say that Cafe Stories ranks as one that I would definitely recommend. It's not the cheapest that you can get (Vietnamese Pork Rolls can range from $3.50-$6.00 in price depending on where you are), but it's great value for a $5 lunch near the city. While you're waiting for your Vietnamese Pork Roll, take a moment to check out the artwork and enjoy the old comic book style art. You can also take a seat in the outdoor seating area out on the footpath where you can watch people going about their daily business along busting Harris Street. Haha I love that first photo! Hmmm coriander, carrot, & meat! I love a good meat roll. I don't think they could fit anymore fillings into that sub if they tried.